At this time of year, just like everyone else, I like to look back at what I did throughout the year. For me that is a lot of crafts, especially knitting! Let’s take a look at my 2016 in crafts. 1. Wooden Ball Candleholder – I love how this one turned out! 2. Birdwatching Mittens – For a friend in the UK. 3. Winter Snows Mittens – – Such a fun KAL! 5. Little Sweater Girls – My tiny version of the Icelandic sweater. 6. Hang Dishtowel – No the most exciting project, but one we use everyday. 7. Cornwall Spring Mittens – Bunting! 8. Teeny Tiny Bunny Couple – One of my favorite projects of the year. I love making tiny things. 11. 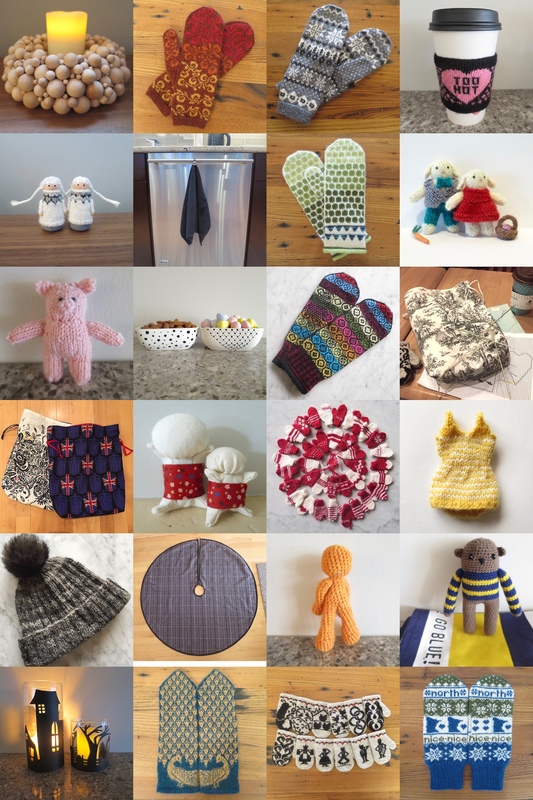 Yarn Ends Mittens – Using up all that leftover Palette for a Minnesota Knitters’ Guild Challenge. 13. More Drawstring Project Bags – These are in constant use. 14. Sarubobo – These make great pincushions. 15. Mini Mittens – I made about 40 of these this year to give everyone at my Project 365 house party in the UK. 16. Tiny,Knit Retro Swimsuit – A test for a bigger project you may see this spring. 17. Souvenir Hat – Using a pompom I bought on a trip to Germany and the handspun I bought in England. 22. Pride and Prejudice Mittens – One of this year’s fair entries. 23. 12 Days of Christmas Mitten Garland – This KAL took half the year, but it was such fun. 24. MN Nice Mittens – A patten I design for a Minnesota Knitters’ Guild KAL next month. I also took two ribbons at the MN State Fair this year, hosted two knit alongs and a design along, and had a project publish in the French book, Réinventer Lego. In 2017, I want to continue to design more knitting patterns and I have at least two more knit alongs ready to go. I hope to have a pattern in at least one book and plan to try getting accepted to more things. I want to go back and clean up some of my older patterns to get them to a better standard. I also really want to knit myself a sweater, I say this every year, but this year I am really going to try! What are your craft goals for 2017? 2 years ago by Kat in Crafts , Crochet , Knitting , Sewing | You can follow any responses to this entry through the RSS feed. You can leave a response, or trackback from your own site. My 2017 goal is the same as it’s been for the last few years. Use up my stash! I’ve been knitting for over 60 years, and in addition to my own stash, I inherited my mother’s stash 20 years ago. Most of it is worsted-weight, more suited to hats than to mittens, so that’s probably what I’ll make. I’m enjoying your blog very much. Thank you. My Knitters’ Guild is doing hats for charity this year, sounds like you need something like that, knit up lots of hats with that stash. That’s where many of them go. I knit hats for Ship Support, and have also done some for local shelters, and for chemo caps. Good for you! I hope to get through some of my stash this way too! Great to see what your up to. I was told by your dad about this website. I’m doing some knitting and other handcraft as well. Working as a teacher in textile crafting. I’ve tried to have a webpage and various ways to publish what I’m doing, but what I use the most is instagram (emmeonatte) and facebook (Maria Sjöberg). Would be great with a contact, since we seem to share the same interest.